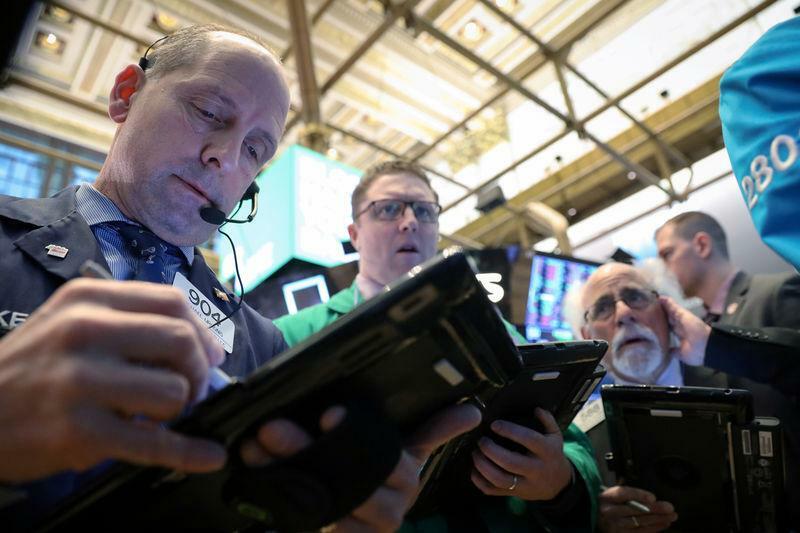 NEW YORK (Reuters) - Small-cap stocks were among the biggest losers during the stock market's rout late last year as investors worried about high leverage, but they have outperformed in 2019's rebounding market, with shares of debt-laden companies leading the charge. An expected pause in the Federal Reserve's course of interest-rate hikes - and optimism that a recession is not imminent in the next 12 months - support a further run in small-caps, investors say. The caveat is that as economic growth and corporate earnings taper off, these companies will find it increasingly difficult to make payments on their borrowings. Small-cap stocks' performance typically tracks investor appetite for debt. Though the median debt-to-equity ratio for the S&P 500 is greater than that for the Russell 2000, small-caps are seen as more sensitive to debt concerns because such companies often secure financing through bank loans with adjustable rates rather than fixed-rate bonds. Last year's rise in interest rates means more and more highly-indebted companies may have to scramble to make payments. The number of companies struggling with debt obligations is near record highs, according to the Institute of International Finance. "With still-low interest rates and an environment of still-solid growth, the concerns about how many (companies) will default are just pushed off to the next slowdown in the cycle, which we don't see happening anytime soon," said Kate Warne, investment strategist at Edward Jones in St. Louis. "They've dropped so much that they've become an area of interest to screen," said Scott Hood, chief executive at First Wilshire Securities Management in Pasadena, California, of highly-leveraged small caps. At last week's news conference, Federal Reserve Chairman Jerome Powell said that the U.S. central bank was monitoring corporate debt levels. "There's going to be a big focus this year by companies in general, but also small caps, to de-lever as much as they possibly can before the economy deteriorates," said Kristina Hooper, chief global market strategist at Invesco in New York. Even those sanguine on the prospects for small caps, such as Eric Marshall, portfolio manager at Hodges Capital Management in Dallas, say they have focused more intensely on companies' balance sheets when picking stocks. Tim Ghriskey, chief investment strategist at Inverness Counsel in New York said the recent run-up in small caps is "simply a dead-cat bounce." "The levels of debt for not only small caps but also selective large caps remain an issue," he said.